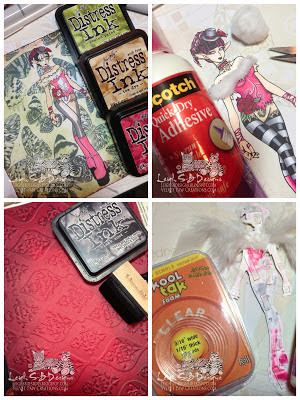 Velvet Paw Creations: Fur & Feathered Goth Fairy for Smudgy Antics! Fur & Feathered Goth Fairy for Smudgy Antics! 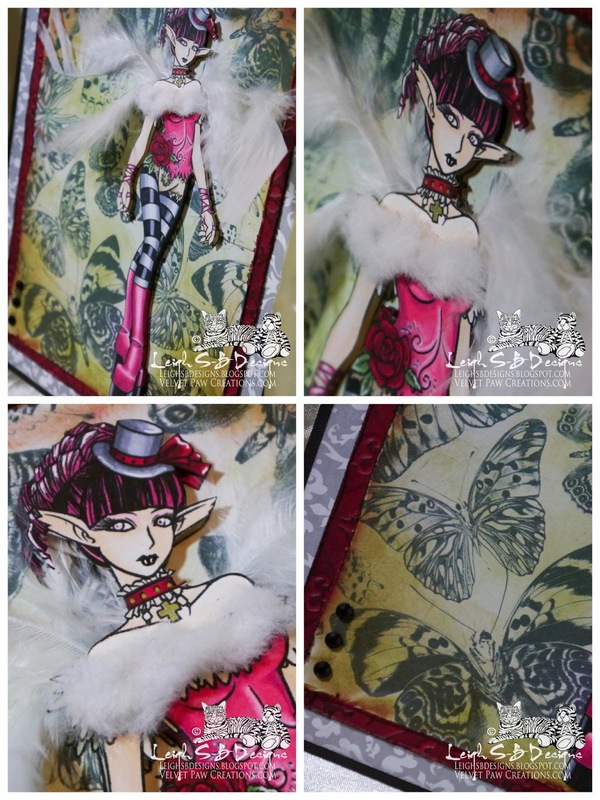 The Goth Fairy is one of Smeared Ink's beauties and she comes with as set of 9 Goth Fairies! I also used the 3 butterflies from their new set called Specimen Jar and created a collage for my background! Click on the photos to enlarge them. 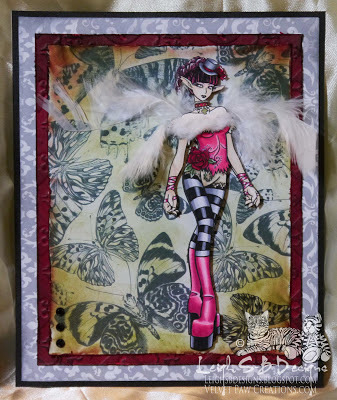 I created the collage and included the goth fairy in Photoshop and printed the collage onto Core'dinations white cardstock. 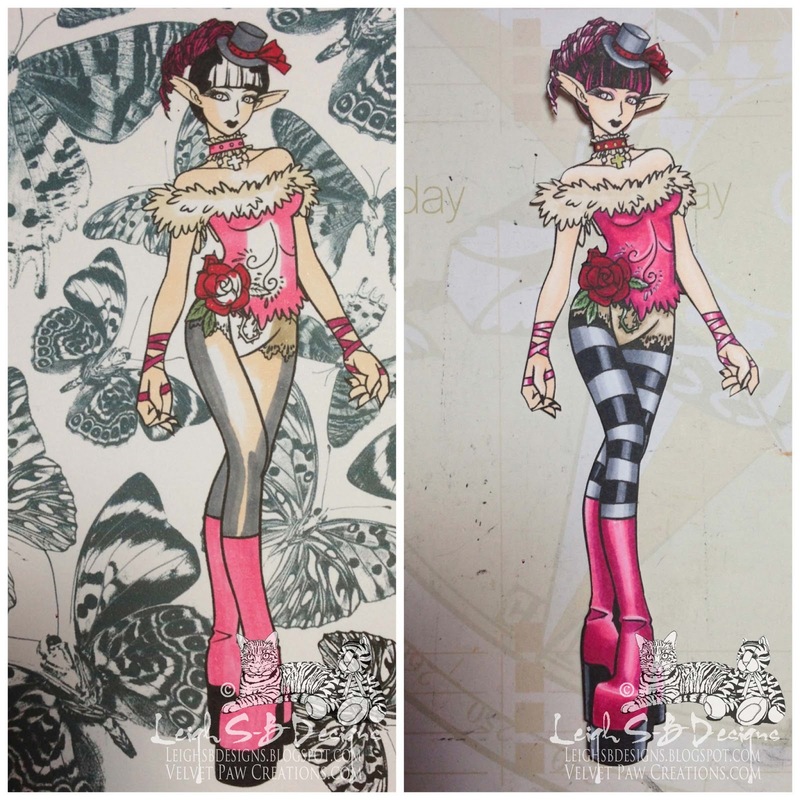 Then printed out just the fairy onto Neenah Solar White cardstock and fussy cut her out. I used Copic markers to colour both fairies but just blocked in colour on the background fairy and coloured the main fairy in detail with shading, added white highlights with a white gelly roll pen and touch of bling by colouring her choker cross with a metallic gold Letraset marker. I trimmed the background panel and distressed the edges with Tim's Paper Distresser tool. Then applied Peeled Paint Distress Ink to the entire panel, then Tea Dye DI concentrated around the edges and corners and finished off with Fired Brick DI. I then adhered my 'fur' to the fairy's bodice with Scotch Quick Dry Adhesive. The fur is actually from a little white pompom and I shaved off bits of it with my scissors to create the fluffy fur. While that was dried I embossed a sheet of red cardstock with an eBosser Regency embossing folder, distressed the edges and applied Black Soot Distress Ink to emphasize the embossed design and the roughened edges. 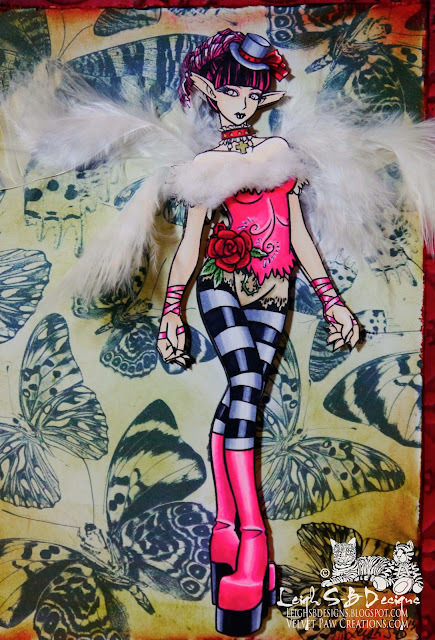 Next came the fairy's feather wings which I adhered to the back of the cut out fairy with more adhesive and also added Kool Tak transparent dimensional foam tape at the same time. While the wings dried I prepared the mats. I completed my art piece by adhering the fairy to the butterfly background and added the 3 black facet cut jewels to the lower left side. Here's a closer look at all the details. Thank you for visiting with me today and before you dash off to enter the Smudgy Antics challenge I'd like to remind you that the current challenge over on my DominoART blog is a fan favourite...Any Game Goes and you can use any theme too so I hope you'll come and play with us! 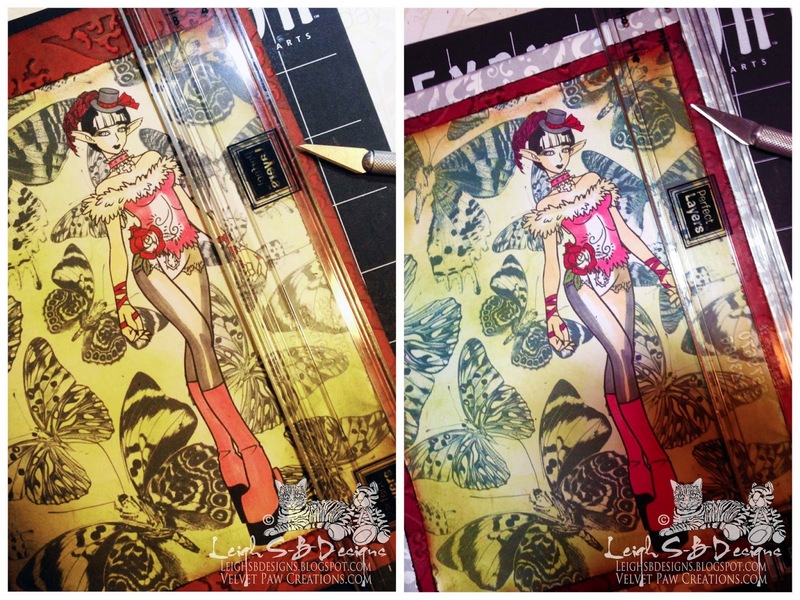 Wow, Leigh, this is so gorgeous! Your coloring is so awesome, love the cotton ball idea! Great job! 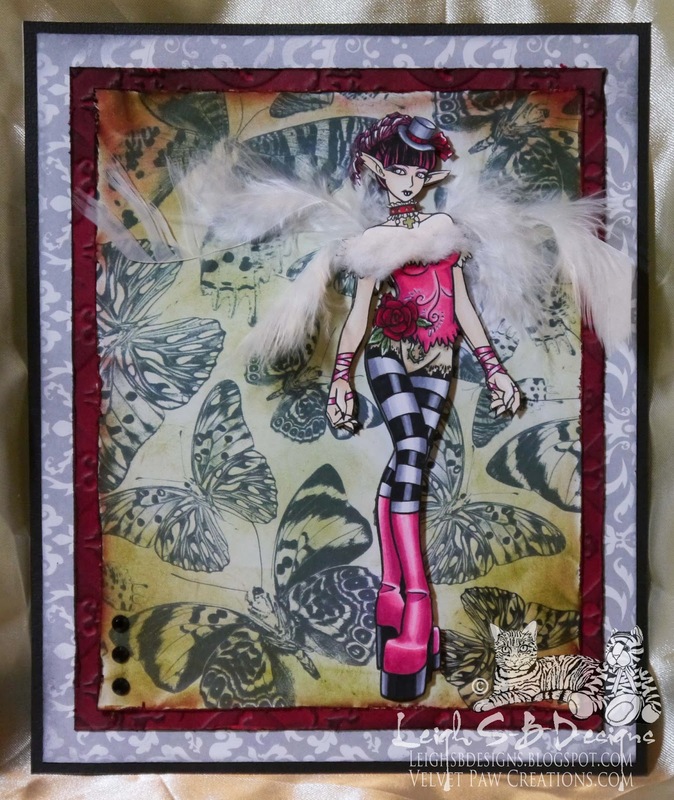 Love this card, reminds me of the Monster High Dolls!! 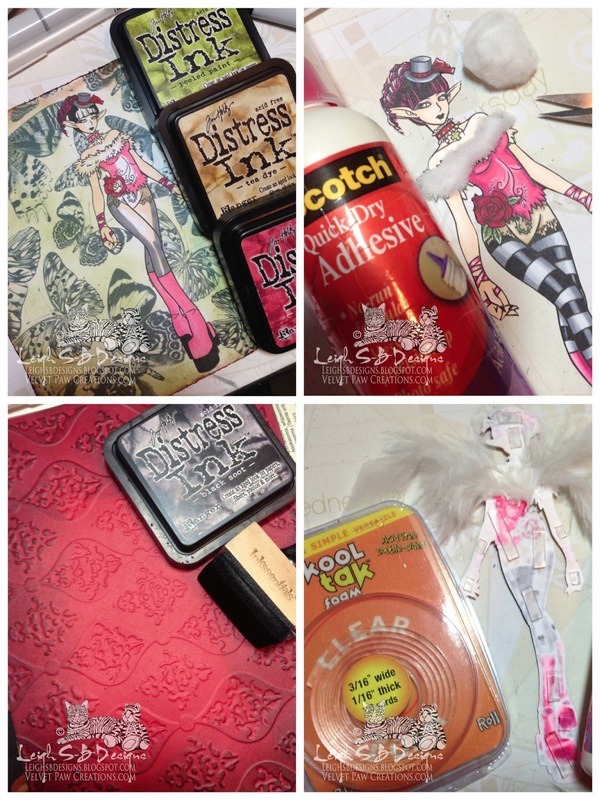 Leigh, your fairy chica rocks! May have to check out that cutting tool. Great use of a pom pom. Day 1 of 15 Days of Half-O-Ween!